Excuse all the bad pictures. I had to work my way around the glare, so many of the pics are taken from strange angles. I might re-take some of the pictures at night to replace them later. I also took a picture of literally everything (I think) so this may be quite a hit on your bandwith. The head unit comes in a generic no-name box showing a random car that doesn't even have a dvd/gps head unit installed. Also, the user manual has no branding and it's all in broken english. There's a QualiR sticker on top of the unit, and that's about the only sign of any brand. Installation was very easy. Just pop off the vent, remove the two screws holding the original head unit, pull the head unit out, remove wiring harnesses, plug in harness adaptors, and hook up the new head unit, then put everything back in place. 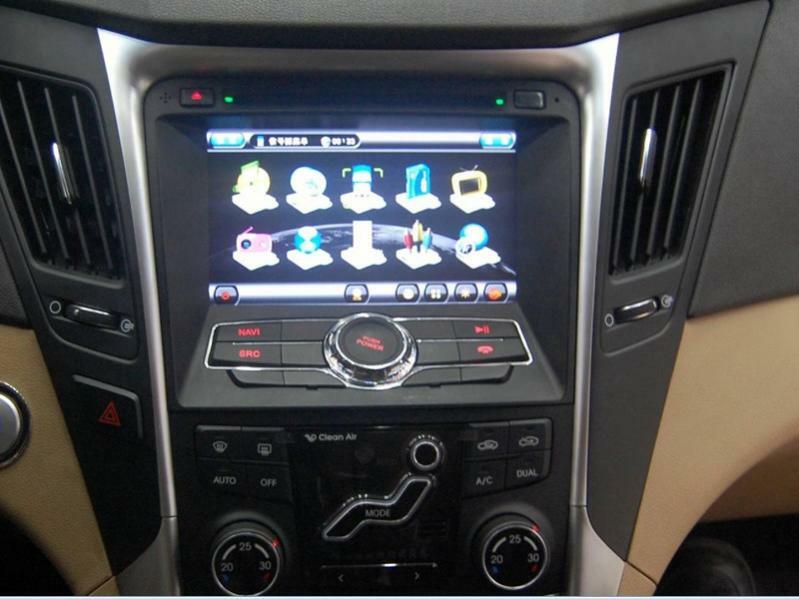 It looks just an OEM head unit, and the buttons have the same kind of style as the factory one. My only issue with the hardware is that the backlit keys are always on, whether your headlight switch is on or off. outside temp still works, along with the clock. And the main screen now shows what the new head hunit is doing (DVD, NAVI, SD, BTMU, etc.). The buttons work the same way they always have, but I did notice a little bit of volume lag while playing music along with navigation. The volume ***** still works without any hesitation though, regarless of what's going on with the system. Navigation doesn't come pre-loaded on the head unit. It has to be added yourself using a MicroSD card, I use igo8 myself... but any GPS software made for windows CE/Windows mobile should work. The first time you run the GPS software it wil ask you where the softwhere is located on the card. Also, you'll see a checkbox for "PK" underneath the file directory. I honestly have no idea what this is for, all I know is that the DVD or video functions won't show any video which it's checked. As I said, uncheck the "PK" box under the GPS directory to allow the head unit to play video. Otherwise you'll get a screen saying "Warning do not watch to Master!" with only the audio playing. Not much to say here. The player has all the bacic functions, and has no problem playing anything I put in it. The touchscreen works with the DVD menu, and the steering wheel controls handle the chapter skipping. The phone feature on this head unit is amazing. It's like a full cellphone built into the car. It has a dial pad with a call back button, phone book, and call log. Very impressive clean UI too. Unfortunatly, the bluetooth buttons on your steering wheel won't work from what i've heard. But I can't comment too much about this, as I don't have the BT buttons on my GX. I couldn't take a pic of the call in progress screen since my phone won't allow me to call and take photo's at the same time. But it looks exactly as it does on this picture from the www.autocardvdgps.com page. A2DP Bluetooth streaming works great, just click on A2DP from the start page and it will automatically pair with your device. Then just hit the play button on either the head unit or device and you're set. Steering wheel track skipping still works as well. I havn't tested this out yet so I'll update you on how this goes. But I can say that the factory aux input in the console no longer works. So I plan on running A/V cables to the console. Then I can finally play my Xbox 360 while I drive. Without anything plugged into the head unit RCA inputs, you get a screen saying "No Signal!" The player is pretty good, but not perfect. You have to browse through your folders on the SD card to go to the song you want to play. I'd rather if it was more like a iPod/MP3 player giving you a list of artist-> albums-> songs, but it's better than nothing. I almost always play music from my phone using A2DP bluetooth anyway. The video player is great. You have to browse through the SD card like "Music", but I don't find that so bad for finding a video to watch. It'll remember where your video folder is anyway. I tested a divx video and works great. No slow downs and the video loads instantly. There is a fullscreen button on the bottom right corner. I'll test some more file types eventually and update you. The solution to getting around the ugly UI is to use the "Music" and "Video" programs from the main start menu on the device. BUT; for whatever reason, those two programs run off the GPS microSD slot, not the "SD" slot on the left. My gps software is under 150mb anyway, so that's no big deal to me. I'm just going to stick with the GPS card slot for music/video, it's a thousand times better. I'm not sure what the maximum card size the SD slots can take, but I tried my 16GB card from my phone and it works fine. The same interface as the SD card. Not pretty, but works fine. Not sure why this is on the head unit, or why I bothered to take a picture of it. I'm guessing it's for loading .pdf user manuals, or reading Tom Sawyer at red lights. Who knows. Without a back up camera, shifting into reverse will give you a screen saying "No Signal!" (just like with AUX having no input plugged in). Also, regardless of having a camera or not, the audio will be very faint while reversing (automatically goes to "1"). I'm guessing it's some kind of safetey feature. The best way I could think of bypassing this is by checking the "LOUD" box in the EQ settings, which will raise the minimum volume. Overall, i'm very impressed by this head unit. I dind't expect a whole lot from a no name chinese product, but this thing is amazing. The screen looks beautiful, with a very sharp image. And the sound is a lot better than the stock unit in my opinion. Especially with the ability to change the EQ. There's a few little quirks, as I pointed out in the review, but nothing major. I have no regrets purchasing this unit, and I think it's worth every penny. If anybody has any questions i'll gladly answer them. Now that you have used it for a couple of months, how do you feel about it? Would you recommend it? How difficult is the installation? I play all my music via A2DP, how good is it in this system?